Time is of the essence when a commercial business is in need of a plumber. The longer the problem goes unresolved, a business could experience considerable downtime involved with plumbing problems. A commercial plumbing contractor can help get a business up and running when it experiences a plumbing problem. If you own a commercial business, HEB Plumbing & Sprinkler-Kathlyn Smith, which is located in Bedford, TX, offers high-quality commercial plumbing contractor services. Our commercial plumbing contractor services are available to industrial and commercial businesses located in Hurst, Euless, Bedford, and the surrounding cities. 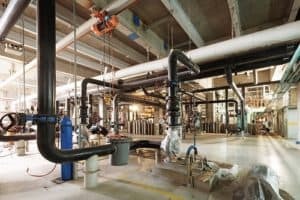 Commercial plumbing contractors can handle a wide variety of plumbing and sprinkler projects as well as sewer and drain cleaning. The types of plumbing problems commercial and industrial businesses experience can vary depending on the situation. Sometimes the problem is as simple as a leaky pipe or a clogged toilet, other times it is just the need for bathrooms, water heaters, or general plumbing to be brought up to code. Regardless of what you need, HEB Plumbing & Sprinkler can provide you with professional plumbers that have the knowledge and experience needed to handle almost all type of commercial plumbing problems. Our commercial plumbing contractors can do everything from simple plumbing repairs to routine maintenance that will help prevent problems from arising in the future. Even businesses are not immune to plumbing problems. In the event your business should experience a plumbing problem, our experienced plumbers are available to fix the problem in a timely manner. Call us today to learn more about our commercial plumbing contractor services.